Plumbing fittings may be plastic, PVC or CPVC or they can be a type of metal like copper, iron or galvanized steel. Plastic and plastic polymer pipe and fittings generally work well for liquids such as water because they will not rust as a metallic fitting and pipe will. Using fittings can change the direction of the liquid that flows through them, pressurize the flowing medium or branch a main supply into several directions at once. Fittings are useful in the design of water and sewer systems as well as irrigation systems. Plumbing fittings are either male or female. Determining the male fittings size requires measuring from each outside edge of the circumference. Female fittings include measurements from the inside opening of the fitting. A male fitting has threads on the outside and a female fitting has threads on the inside of the fitting. A coupling connects two lengths of plumbing pipe together. 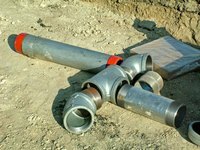 Coupling uses include connecting two entire lengths of pipe together or adjusting the length of a plumbing run by cutting one to the correct size and adding a shorter piece. Caps and plugs form an air- and watertight seal on the end of a plumbing pipe. These can be useful for clean-out areas because they are removable and replaceable. Caps and plugs can withstand the maximum amount of pressure of the liquid within plumbing pipes without releasing water outside the system or air into the system. Directional fittings change the flow of water in a plumbing system. Elbows will turn the flow at a 90-degree angle and Ys will have either one input with two outputs at a 45-degree angle or they may have two inputs with one output depending on the use. T plumbing fittings are useful in redirecting water flow from one input to two lines perpendicular to the input and in both left and right directions at 90-degree angles from the input. Ts are useful in splitting water flow. Directional plumbing fittings help to create constant water flow in a desired direction and can allow navigation around permanent objects. This type of plumbing fitting increases water flow and therefore increases water pressure. Reducing the main water line into a home will provide more water pressure so the water can travel longer distances and have ample pressure for the upstairs portion of a house. Reducers are larger on the input end of the water flow and smaller on the exiting end.